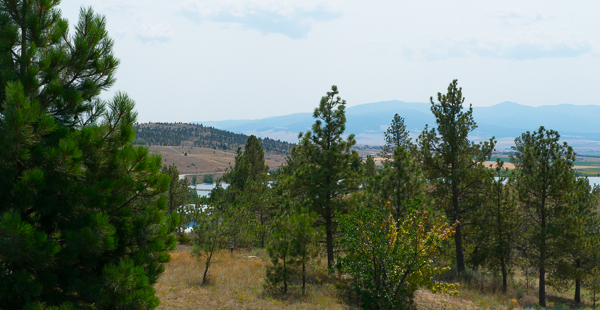 It’s that time of the year again – the last few weeks of summer. Today it’s not so bad; however, yesterday it was in the 90s outside with humidity to match. My husband was watching Michigan playing football on television. Wait a minute, isn’t football watching weather supposed to be somewhat cool? Something like it was a few weeks ago when we were in the Scottish highlands? Well, even though the weather is not cooperating with my current frame of mind, summer’s end is absolutely the best time for tomatoes. However, since I got sick with a nasty bug while in Scotland, soup seemed more appropriate for my situation than another salad. One of the things I love to do when I travel is go to a local bookstore and see what sort of cookbooks written by local chefs are available. Note: Scotland was no different. Recipes for baked goods with lots of oats will be seen on Jeannine’s Cuisine in the future. When my husband and I went to Traverse City, Michigan, at the beginning of the summer I went on my usual cookbook scavenger hunt and found a winner. It’s a beautiful little book called “Fork in the Road,” written by Okemos, Michigan chef, Eric Villegas. The recipes make great use of the local produce, none are too time consuming and “restauranty,” but they all have a little twist to make them interesting. This tomato soup is great made with seasonal summer tomatoes. And don’t limit yourself to just the standard supermarket variety. I imagine you could make this with any variety of heirloom tomato as well. Just be careful when mixing colors so as not to end up with something weird. It will still taste great, but the final color could be a little distasteful looking. Sadly, I do not recommend this soup with anything but the ripest, freshest tomatoes, so you are pretty much limited to making it in the summertime. Think of it this way – those tomatoes are what makes all this heat we’ve been withstanding worthwhile. Unlike traditional tomato soup, the color of this one turns out as a pastel version of whatever tomato you are using. 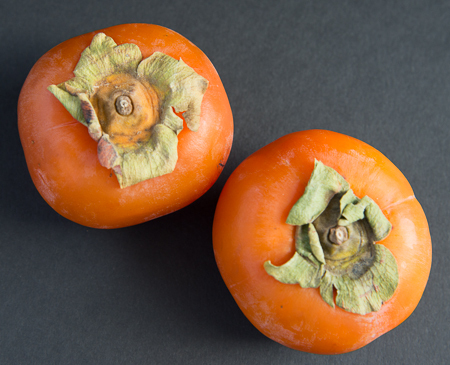 Don’t begin to think that lack of a vibrant color means lack of tomato taste. It’s smoky and delicious. Place the tomatoes on the grill core side up and grill until they turn black, turning once. Use tongs to remove the tomatoes from the grill, placing them and any charred bits you can peel off the grill in a large saucepan. Use a spoon to break up the tomatoes as much as possible. Season with a little salt, pepper, and hot sauce. Continue to taste and season while preparing the soup. Bring the tomatoes to a boil, reduce to a simmer and cook uncovered, stirring occasionally, until tomatoes are reduced to a thick puree, about 20 minutes, but adjust cooking time as needed. Puree the soup in batches in a blender. Note: a Vitamix is great for this, but any blender will do. 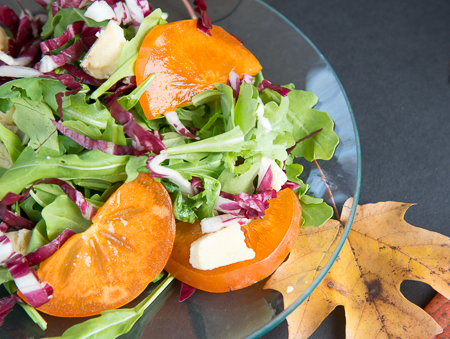 Be very careful when blending hot liquids so as not to splatter the kitchen and yourself with molten tomatoes. Fill the blender container no more than two thirds full at a time and take out the removable center of the lid and cover with a towel with your hand firmly on top. The towel will keep the liquid in the blender, but allow the steam to escape. You can also use an immersion blender to puree the soup, but the texture won’t be as smooth. Return the soup to the pan, add the cream and cook until warm, about 5 minutes. Check seasoning one more time and serve. One of the most important things I learned in culinary school was the difference in the quality of my cooking when I made my own stock rather than buying cartons of it at the grocery store. Because stock is made with bones that contain gelatin, real stock thickens when it’s reduced making for a wonderful sauce or soup, unlike supermarket boxes that remain watery no matter how long you simmer them. The bones you use for your stock can be any kind really, but you will get the best results from bones that have a lot of connective tissue. I like to use chicken necks and wings for chicken stock. Sometimes I will even throw in a package of chicken feet. I have, however, made plenty of great stock from a few leftover chicken or turkey carcasses I’ve stored in the freezer. For beef stock, I use oxtails. It’s worth seeking them out for the gelatinous results they produce. If you can’t find them a trip to a butcher for any kind of beef bones they have on hand will also work. The picture below shows 10 pounds of oxtail ready for roasting. I make and use a lot of stock, especially chicken. So I keep a plastic box in my freezer in the kitchen for vegetable scraps. Celery going limp? Into the stock box. Mushroom stems? Ditto. The left over green parts from trimming leeks? Into the box they go. You could also use those two leftover scallions or that parsley or thyme that have been in the fridge a week too long. Those turnips you were going to turn into a gratin, but never got around to it. Sound familiar? Just don’t use broccoli or peppers. The flavor is too strong. And celery leaves will make the stock bitter. Of course my method will make your stock taste slightly different each time you make it, so if you are a stickler for absolute consistency, you might not want to do this. 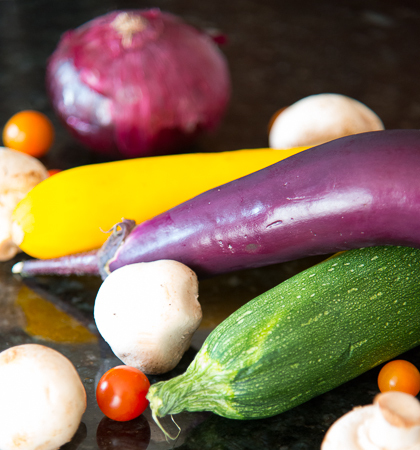 If you decide to, you will need to adjust the amount of vegetables you add to your stock accordingly. 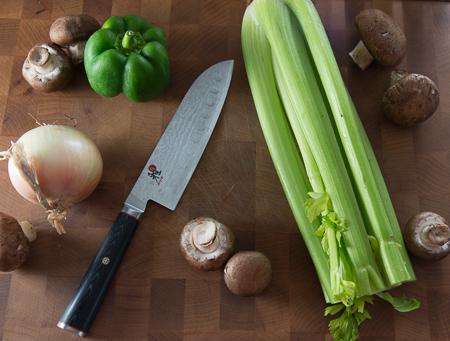 I make this stock with these ingredients in a 16-quart stainless steel stockpot. After I make it, I place it in various sized plastic containers and store it in the freezer. If you don’t have a stockpot this large or don’t want to make this much stock, this recipe can be scaled for any amount of bones you want to use. 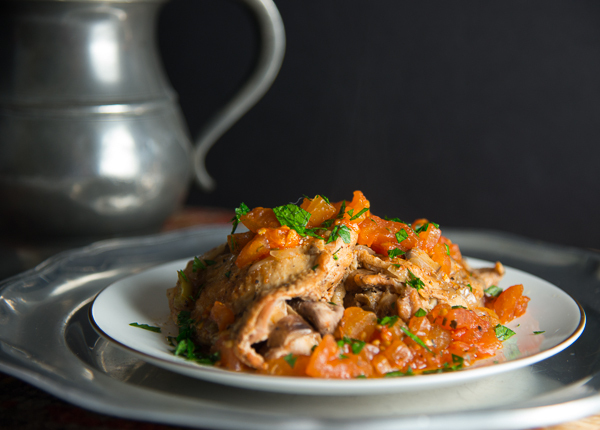 You could even just use a chicken carcass from a roast chicken. Just adjust the ingredient amounts accordingly. Some people prefer to store their stock in plastic bags. I would have a disaster on my hands if I attempted to pour stock into plastic bags, but it does save space in the freezer. The technique for making any type of stock is pretty much the same so I am combining both beef and chicken here. Differences between the two are noted, but basically the differences are that I roast the beef bones and use tomato. When I make chicken stock I do not roast the chicken bones. You can certainly do so. The results will be a darker more robust stock. 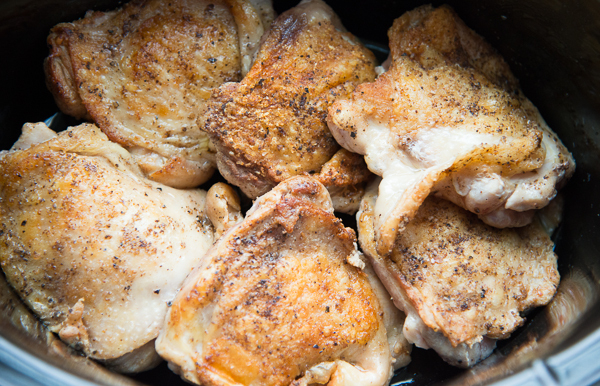 Chicken stock also cooks for less time – 4 hours versus 6 hours. 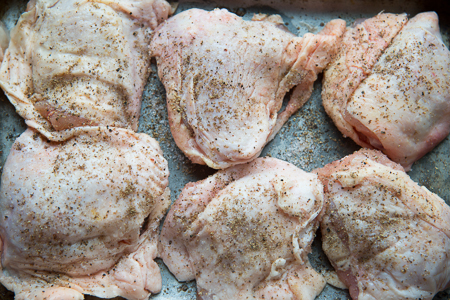 To roast the beef (or chicken if you desire) bones, preheat the oven to 350 degrees. Grease a large roasting pan and place the bones in it in one layer. Roast the bones for 1 hour. Place the bones in your stockpot. Add just enough water to cover the bottom of the roasting pan and use a spatula to scrape up as much of the fond (brown bits) off the bottom of the pan as you can. Pour the water with the fond into the stockpot with the bones. Add enough cold water to the stockpot to cover the chicken or beef bones but still leave room for the vegetables. Bring the bones and water to a boil over high heat, then lower the heat to a simmer. You want the liquid to be barely bubbling. Use a slotted spoon to skim the scum off the surface as it bubbles up. When the liquid is fairly clear of scum add the remaining ingredients to the pan, but do not stir them in. They just go in a big pile on top of the bones and water. Keep the stock at a simmer for 4 hours for chicken stock and 6 hours for beef stock. Do not stir the stock, or it could become cloudy. Do not boil the stock for the same reason. You don’t need to watch it constantly, but check on it periodically to make sure it’s still simmering or has not become too hot. I find I am adjusting the temperature slightly throughout the cooking process. When the stock is done strain it through a fine strainer into a very large bowl. Skim the fat off the stock. Or, you can do as I do and refrigerate the stock overnight and just scoop the fat off the next day. Your stock is now ready to use or freeze in containers of your choice. I hope everyone has enjoyed this summer. We have been particularly busy this year but have still had time to enjoy all the wonderful produce that is at the markets this time of year. It will be gone before we know it. 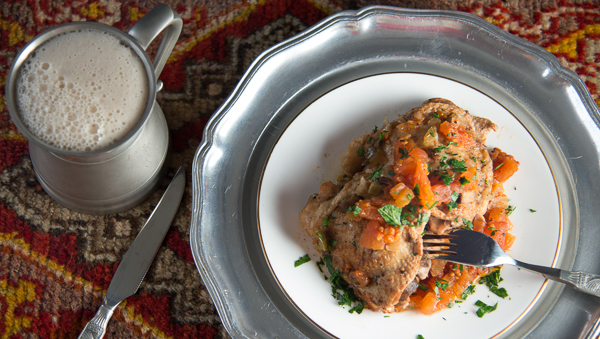 My first experience with caponata was years ago, when a colleague who was living in Rome at the time asked if I would send some coffee to him from Bogota, Colombia, where I was living. I agreed if he would send me a box of Italian pantry items in return. He did not disappoint; what a haul! Years later, I’ve never forgotten it. 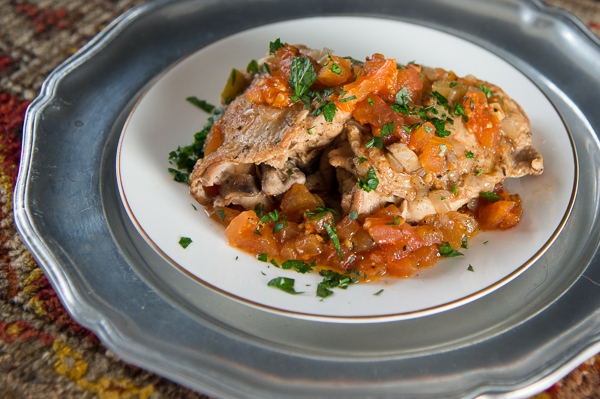 One of the items in the box was a can of caponata. Even the Italian canned version was delicious and I resolved to make a fresh version at home. 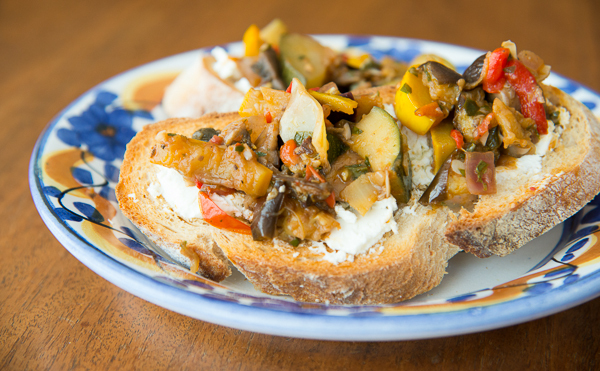 I’ve tried many versions of caponata over the years, but this one surpassed all the others. Maybe it’s the capers. My husband is always giving me a hard time about my extreme love of capers. Honestly, I could eat them on almost anything – well, maybe not ice cream…hmmm. 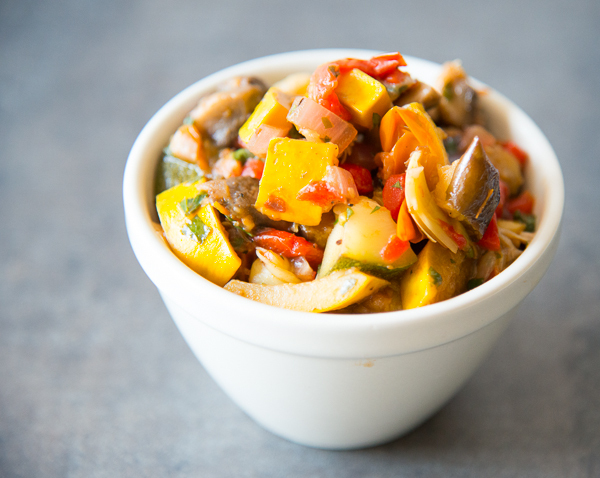 Caponata is a sweet and sour cooked vegetable dish that originated in Sicily as a side for fish dishes. It was originally made with eggplant and celery, but today there are numerous versions that can contain everything from pine nuts to octopus. 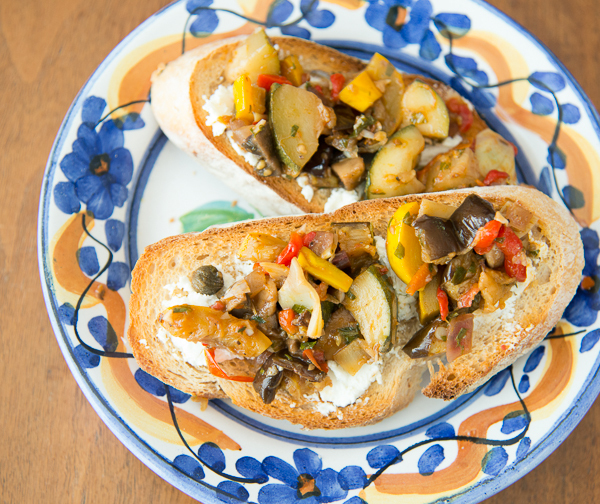 Caponata is a wonderful way to use up some of that extra summer produce from the garden or the farmers market. 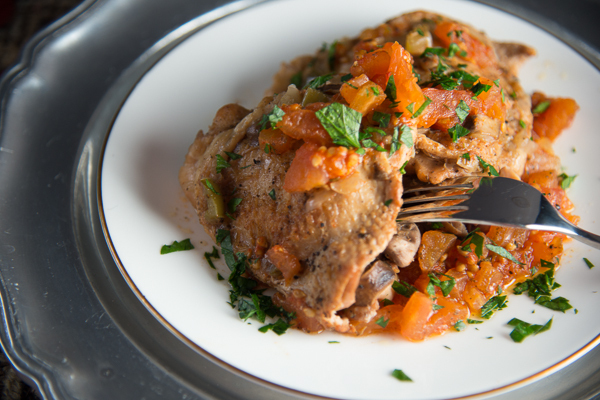 It can be used in a variety of ways – as a side with virtually any meat, or as part of an antipasto platter. I’ve even seen it whirred in a blender with olive oil and vinegar and made into salad dressing. However, my favorite way to enjoy it is for lunch as a topping on crusty bread with a nice schmear of fresh ricotta or goat cheese. 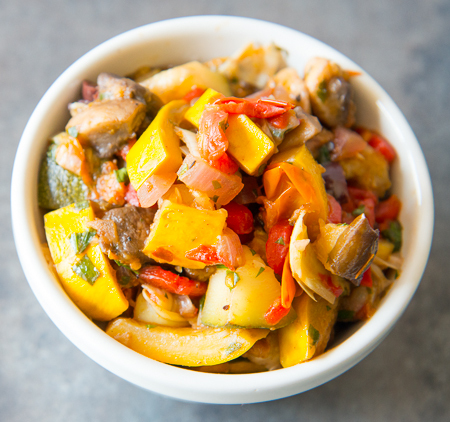 Caponata can be prepared up to 3 days in advance. Serve warm or at room temperature. 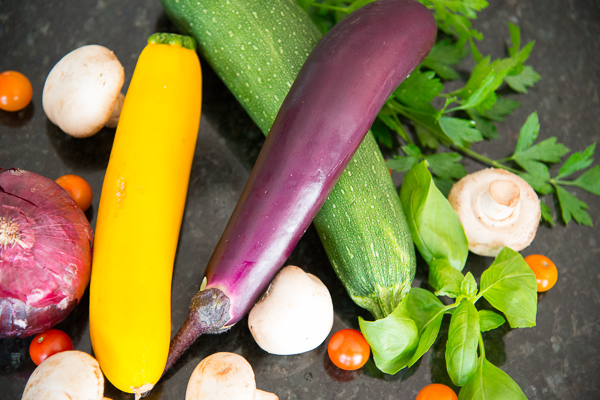 Feel free to substitute zucchini for the summer squash or even use one of each. Serve as a side dish, as a dip for pita crisps or crackers or on bread with ricotta or goat cheese. Preheat the oven to 450 degrees. Place the eggplant slices on an oiled sheet pan and brush with 2 tablespoons of the olive oil. Season with 1 teaspoon of the salt. Bake until tender, about 25 minutes. Cool slightly then chop and set aside. Slice the summer squash lengthwise and scoop out the seeds. Chop into 1/2-inch dice and set aside. Heat the remaining 2 tablespoons of olive oil in a large wide saucepan or dutch oven over medium high heat until the surface is shimmering and you can smell the oil, 1-2 minutes. Add the mushrooms, onions and chopped squash to the pan. Cook, stirring occasionally, until the vegetables begin to brown, 4-5 minutes. Stir in the garlic and cook 1 minute. Stir in the red wine and vinegar. Add the tomato, red pepper flakes, black pepper, and remaining 1 teaspoon salt. Cook, stirring, until the tomato softens, 3-4 minutes. Stir in the tomato sauce, roasted red pepper, capers, olives, basil, parsley, and the chopped eggplant. Reduce the heat to medium-low and cook until thickened, about 3 minutes. I hope everyone is enjoying a beautiful Spring day with friends and family. When I wrote this the sky was blue, the sun was shining, and the birds were chirping as I sat next to an open window taking it all in. I was smiling indeed. 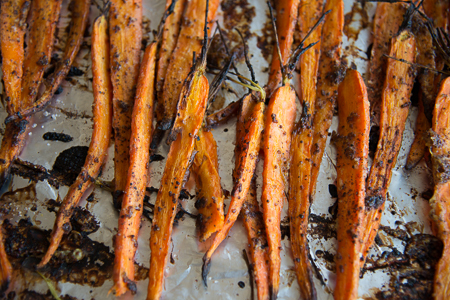 I’ve wanted to do a roasted vegetable recipe on the blog for some time. 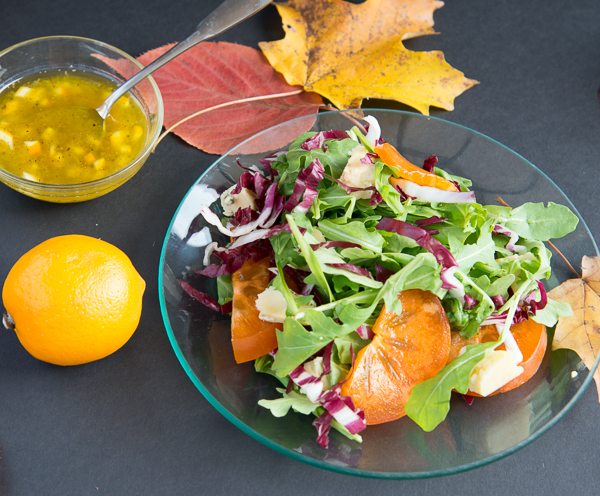 It is actually my absolute favorite way to cook and eat vegetables – drizzle with olive oil, roast at 400 until fork tender, sprinkle with sea salt, and eat. Then while the husband is out walking the dog, sneak a few more pieces of the leftovers, mmm. Food eaten on the sly just tastes better, don’t you think? My husband probably would not mind me eating these leftovers in their entirety. His dislike of cooked carrots is notorious. His mother used to say that carrots were only good for horses, and I believe it rubbed off on him. But, these carrots are so good, I think he’ll even eat them. 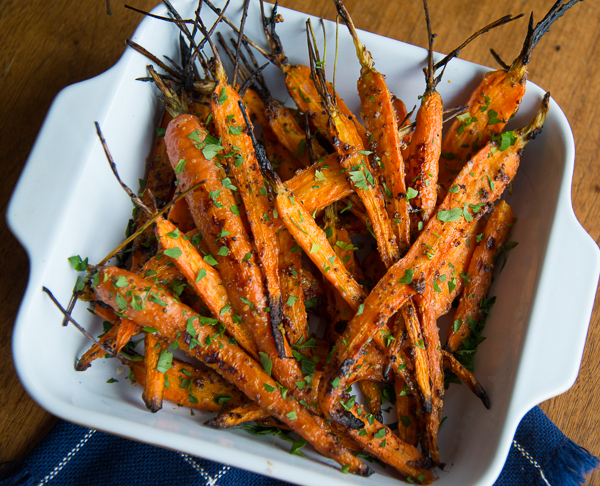 Carrots are part of the “umbrella” family of vegetables and are related to parsnips, fennel, parsley, anise, caraway, cumin, and dill. 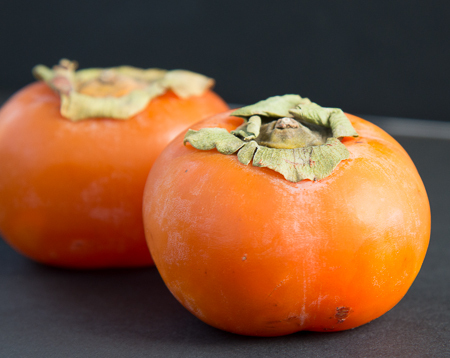 They are said to lower chances of cardiovascular disease, probably because of the gajillion vitamins and antioxidants they contain. These beauties would probably be even nicer if you used the multi-colored bunches of carrots that are turning up in the stores these days. They make a nice side for an Easter meal, or any other time of the year for that matter. When I roast vegetables I usually just put them in the bare pan and let the olive oil keep them from sticking. Because of the honey in this recipe be sure to use foil in the pan, and spray it well. Preheat the oven to 400. Cover a baking sheet with foil and spray well with cooking spray or oil. Stir the mustard, olive oil, and honey together in a large bowl. Toss in the carrots and mix well (hands really work best for this) until thoroughly coated. Place in a single layer on the prepared baking sheet and sprinkle liberally with salt and pepper. 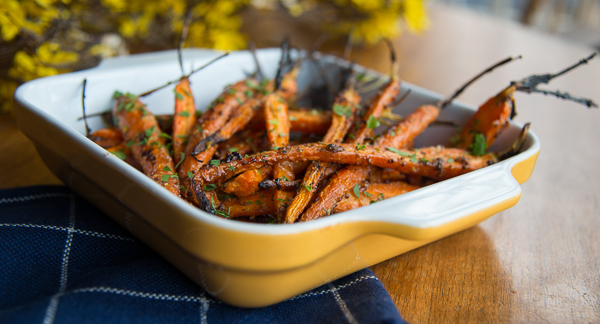 Roast the carrots in the oven until they are fork tender, approximately 25 minutes. 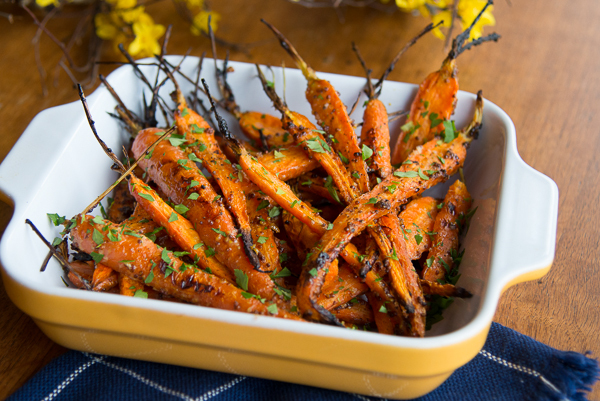 Sprinkle the carrots with the parsley and serve. Happy New Year! In years past, this would be the time that I would be anticipating the wintery, dark, diet days of January that I would soon abandon in favor of what I refer to as “chocolate season” in February. 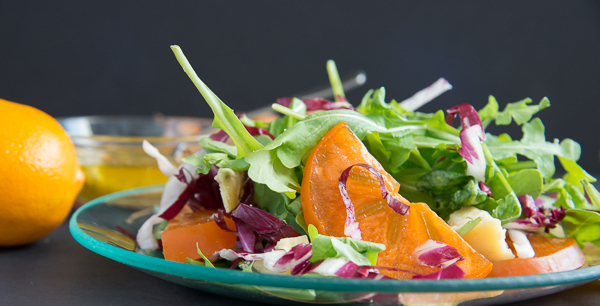 I absolutely hate the word diet — so much deprivation! So, this year I’ve decided to take a different approach. Rather than a long list of resolutions, I’ve decided to follow Michael Pollan’s advice from his book, Food Rules — An Eaters Manual. “Eat food. Not too much. Mostly plants.” That’s it — simple, really. I started Jeannine’s Cuisine in October of 2014 as a way to provide copies of my recipes to friends and family who were always asking for them. Since I started the blog, I’ve often asked myself if I should have some sort of theme — Mediterranean? gluten free? Paleo/Primal? Pastry? Then I realized that Jeannine’s Cuisine is all of that. It’s the way I eat, which encompasses a huge variety. But, in spite of my “everything in moderation” stance, there are still a few “rules” I go by for both this blog and the way we cook and eat. Let me just put it up front – I love pastry. Of course, I do — I’m a former French-trained pastry chef. But, I seriously believe that sugar consumption is probably at the root of America’s obesity problem, and reading as much about nutrition as I do, I can’t recall EVER coming across anything that said it was good for you. Yes, I do some baking, and you will continue to see some baking recipes on the blog in the upcoming year, but, at least until February (smile), in limited quantities. It is January, after all. I tend to bake things I can freeze, then thaw one piece of whatever it is at a time. It keeps my sweets consumption in check, but still allows me the occasional treat with my afternoon tea, or even breakfast. Another big part of Jeannine’s Cuisine that will continue in the New Year is to use/eat as little processed food as possible. I’d absolutely love to be one of those homemakers I read about who put up vegetables every fall and bake artisan bread every week. Unfortunately, I have something called a full time job that prevents that, but I can try. Yes, it’s a lot of work to do the cooking I do. I spend a LOT of time in the kitchen, but it’s so worth it when my husband beams when he has a spoonful of a delicious soup that I’ve just made from scratch. 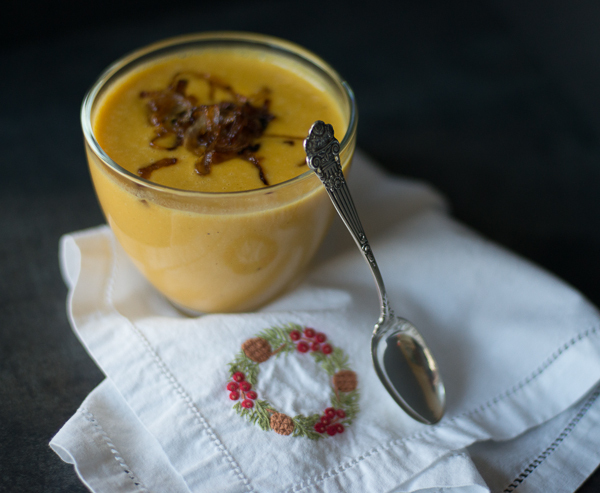 This butternut squash soup is one of his favorites. Mine too, for that matter. 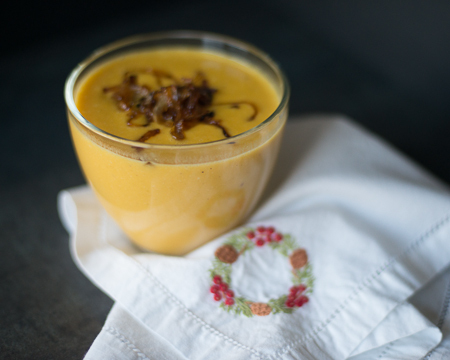 If you have a Vitamix or other high- speed blender, it will turn your soup into velvety goodness. If not, you can still get the same smoothness, it will just be a bit more work. Either way, as we look forward to the wintery, dark, no dieting days of January, we know we can stay warm inside with a delicious, good-for-you bowl of soup. Spring is a long way off. Stay warm my friends. Let’s make some soup! We used beef tallow for caramelizing the onions, but realize most people don’t keep tallow in stock. Bacon grease, butter or even some sort of mild oil will work as well, but you will need to adjust the heat on the onions accordingly to allow them to brown without burning the fat. Halve the sweet onions lengthwise and thinly slice. Melt the fat in a frying pan and cook the onions on medium heat or lower, stirring frequently, until golden brown. Place the onions on a paper-towel lined plate and set aside. Melt the butter in a large dutch oven over medium heat. Add the onions and sauté until soft, 4-5 minutes. Stir in the broth, squash, pears, thyme, salt, pepper and coriander. Bring to a boil, reduce to a simmer and cook until the squash is tender, approximately 15 minutes. Puree the soup in a blender in batches, pouring it into a bowl after each batch. If you do not have a high-speed blender such as a Vitamix, after blending the soup, pour it through a fine strainer into a bowl, scraping it as necessary. After all the soup is blended, return it to the pot. Stir in the cream and reheat the soup, stirring frequently. 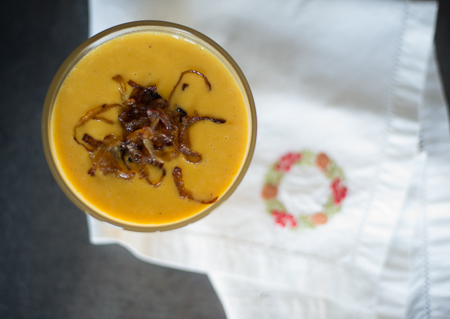 Ladle into bowls and garnish each with a spoonful of the caramelized onions. Cauliflower the week before Thanksgiving? Really, Jeannine? I had a great time on Feedly with my morning coffee today, catching up on my blog reading, checking out all the wonderful Thanksgiving recipes on the internet…the turkeys, the stuffing, the potato recipes, the pies. I absolutely love Thanksgiving and this year is no different. But thinking ahead, I still have to get dinner on the table, and in light of the huge cooking and eating event on the calendar, I’d like those dinners before and after to be relatively healthy, oh…and really easy to prepare. Today’s recipe goes with anything; fish, chicken, you name it. It’s super easy, requires only a few ingredients, and it’s delicious. You can replace the walnut pieces with pecans, hazelnuts, or even pistachios. Toast the walnut pieces by placing them in a small frying pan over medium heat until you begin to smell them and they start turning brown. Remove the walnuts from the hot pan to a clean plate and set aside. 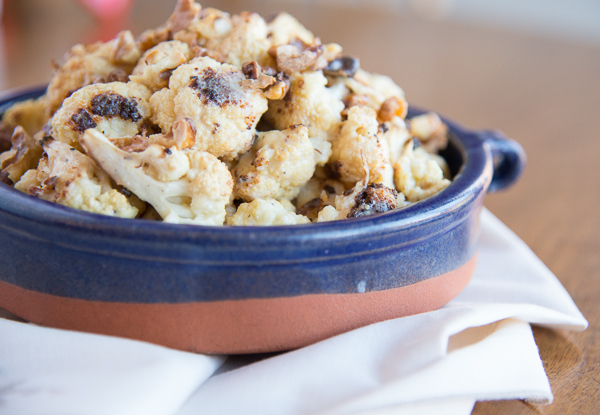 Place the cauliflower in a clean sheet pan, toss with 2 tablespoons of the oil, and sprinkle with salt and pepper to taste. 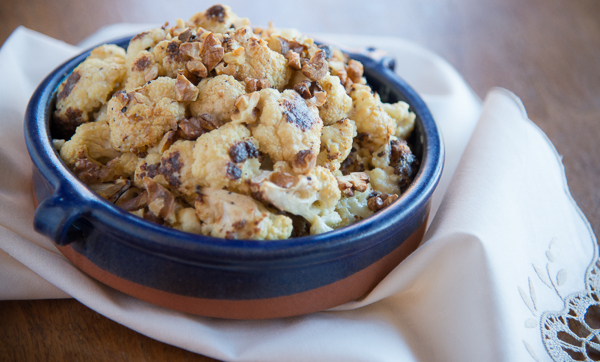 Roast the cauliflower for 15-20 minutes, stirring once or twice, until it begins to char in places. 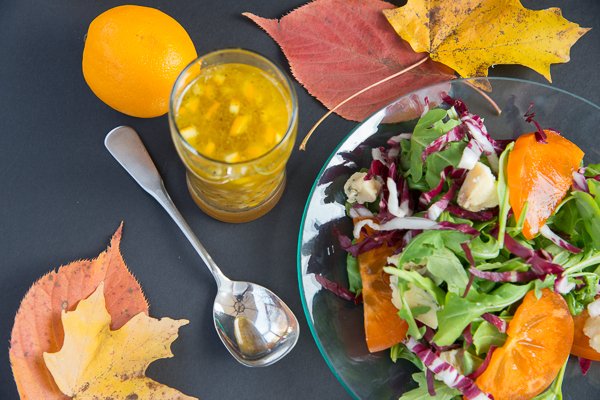 Whisk the remaining oil with the lemon juice, mustard, and half and half in a large bowl. 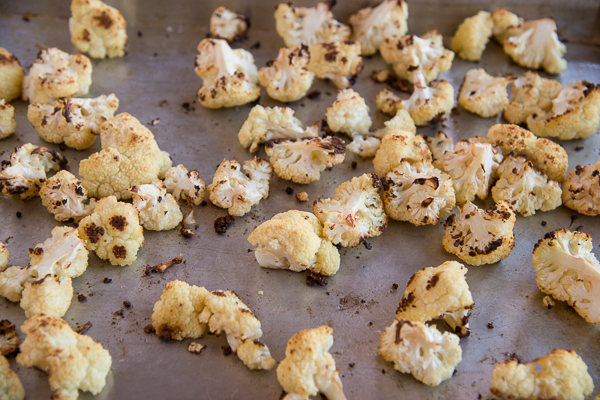 Add the cauliflower to the boil, scraping any brown bits and remaining oil from the sheet pan into the bowl as well. 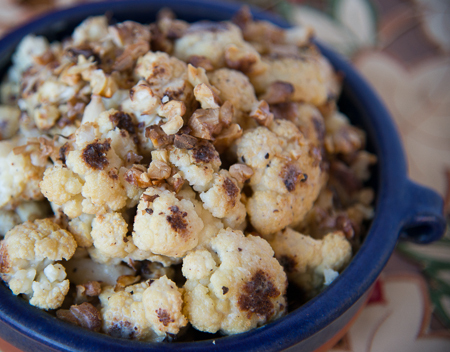 Toss the cauliflower with the dressing, add the walnuts and toss again. Check the seasoning and serve warm.